Regency - Jane Austen style 1. All vintage reproductions. JA1 Made some years ago by designer Olivia Barnard-Firth, "The Wicked Lady", for a client who attended many balls and masques. 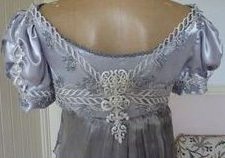 The underlying dress is silver-grey polyester satin. The outer swathe of fabric is metallic, from the 1920s. 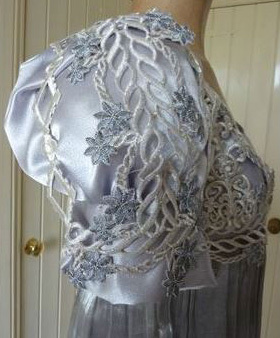 The bolero is chemical lace; it has caused some pulls in the underlying bodice fabric, but they don't show when the bolero is in place. JA1 without the bolero. XS Bust 83cm, empire waist 71cm, length 137cm. $110. JA2 XS-S B 78, empire waist 66, length 148cm. Made in the 1980s. $30. See also CHD8. JA3 S B 87, empire waist 75, length 145cm. Crushed velvet, colour slightly deeper than in photo. Made in 1970s. Rental $45, deposit $65. Not for sale. JA4 S B 90, empire waist 68, length 139. Designed to be worn loose. Made in the 1930s. Satin-backed crepe. Jane Austen might not have worn sequins, but Lydia Bennett would have! $175.